The members of Ingenzi Knit Union knit 800 cowls for Anthropologie. Anthropologie, working with Rwanda Knits' partner, Indego Africa, ordered the cowls (aka snoods) for all their brick & mortar stores plus their online sales, thanks to a connection with Linda Trau, one of Anthro's founders. Check out the Photo Gallery to see more cowl production photos. On October 28, 2010, the Ingenzi Knit Union receives its National Registration as the first and only Cooperative Union of its kind in Rwanda! Ingenzi Knit Union exhibits at the Kigali International Exhibition! This major export/trade show is held in Kigali, Rwanda each year. The Knit Union was invited to participate by the National Women’s Council and the Gasabo District. They were able to connect with schools needing sweaters and a number of importers. 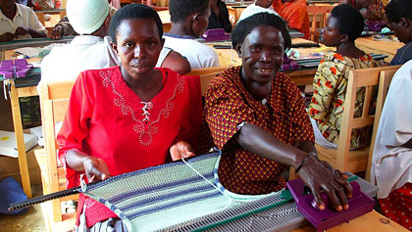 November 2008: Rwanda Knits received $5,000 grant from the Yahoo Employee Foundation! These funds helped in capacity building in cooperative management for the three primary cooperatives that have formed the Ingenzi Cooperative Union. Dining for Women Supports Rwanda Knits! Rwanda Knits is excited to be the featured project to be supported by Dining for Women during the month of December. For visitors interested in DFW, please visit diningforwomen.org. We are very grateful for their generous support! As with every new business, after the training, practice and learning period is over, it’s time to fly and become a self-sustaining business. That was always the plan for Rwanda Knits: to no longer be necessary. The knitters of the Ingenzi Knit Union are now on their own and are a successful, sustainable business. They have also partnered with Indego Africa (you can read more about both the members of the IKU and Indego Africa) for creating knitted items for export — and for learning English and computer skills. From school uniform sweaters to items for export, the 150 members of the IKU stay busy and supporting their families in Rwanda. Many thanks for all those who supported the project financially over the years including USAID, Women for Women, Yahoo Employee Foundation, Dining for Women International, UNIFEM, the Three Rivers Crochet Group, BPeace, and many other donor supporters! If any of you would like to continue to support the knitters, please make your donations to Indego Africa. A huge thanks to former Project Manager, Patrick Nimubona, who is now Director for CHABHA, another NGO in Rwanda, and to Laura Hanson-Schlachter, who, with Patrick, trained the members of the IKU in cooperative management — and to all the amazing and talented members of the Ingenzi Knit Union, who continue to be an inspiration to so may other artisan cooperatives in Rwanda! I will miss all of you! Rwanda will always be in my heart. RWANDA KNITS provides hand-operated, American-made knitting machines, technical, and business training to low-income Rwandan women. Our program enables them to increase their incomes through economically sustainable knitting cooperatives, through which they produce garments for their domestic market and export markets. Rwanda Knits is 2010 recipient of $40,000 grant from the Yahoo Employee Foundation! Through a USAID grant to our sister Rwanda-based NGO, Rwandans Allied for Peace and Progress, Rwanda Knits has enabled over 1,200 women to earn a living through making and selling their knitted goods. The organization has provided over 600 knitting machines and training to women in 17 associations throughout the country. The project has been described as one of USAID Rwanda's most successful income-producing projects. Today these associations have formed 29 knitting cooperatives who are registering as primary cooperatives, soon to be forming the country's first Secondary (umbrella-type) Artisan Cooperative. For women with limited skills, education and virtually no income, Rwanda Knits has created new hope for them — and you can be a part by making a tax deductible donation today! Nearly 1,000 women in Rwanda are now members of 29 knitting cooperatives, having been trained by Rwanda Knits' six traveling teachers using yarn donated by Caron International. Since their training in the spring and summer of 2006, orders of over 3,000 sweaters for school uniforms, baby clothes and over 3,000 items for export have been secured, produced and delivered. With Rwanda finding peace, building sustainable businesses for the majority of the population that still survives primarily on subsistence farming, making less than $1 per day, is a top priority. But with a growing middle class, there is a real opportunity to grow the knitting business both domestically and internationally. 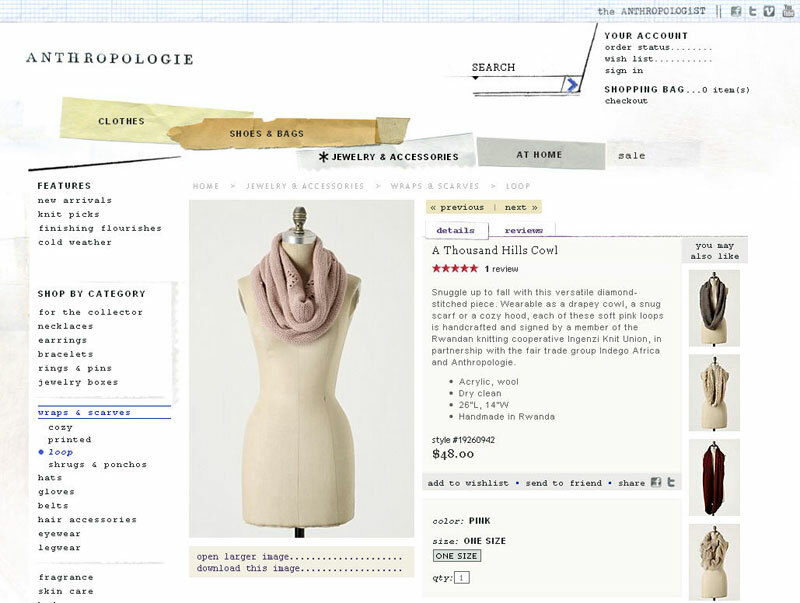 An example is the Whitney Port scarf, mentioned in the March 2009 issue of Fast Company. Here’s a member of the Susuruka knitting cooperative at Millennium Villages in Bugesera modeling one of the scarves. Rwanda is a country focused on cooperatives, so now that the knitters know the machines quite well, Rwanda Knits' work is now focused on capacity building: cooperative training and registration so these nascent small businesses can become 100% sustainable without our involvement, providing a living wage for the knitters and their families. Your contributions help provide the business training to help Rwanda Knits achieve its goals of having all the knitting cooperatives it supports totally sustainable by 2012. From June 2005 through June 2007, Rwanda Knits was funded by a grant from USAID (US Agency for International Development), which funded the purchase of the knitting machines, the technical training and administration costs. While a few grants are pending, Rwanda Knits depends on grants from you to enable the knitters to grow their businesses and develop their skills. You can help Rwanda Knits bridge the funding gap and so the knitters can receive the training to build their businesses - and feed their families - by making a donation to Rwanda Knits today! Just click on the DONATE button above and send what you can. Murakoze canay — Many thanks! Rwanda Knits is part of the Centers for Social Responsibility (CSR), a registered 501c3 nonprofit corporation. All contributions are tax deductible. From March 24-27, Rwanda Knits, using funds from Dining for Women donations, held a Sales & Marketing workshop for representatives of six registered cooperatives. Covered were the five legs of marketing: product, price, promotion, place and people. Attendees were active participants and learned how to write sales contracts, price their products, maintain sales and inventory records and underscored the importance of good bookkeeping. In May, 2006, the partnership of RAP/Rwanda Knits, the Business Council for Peace (BPeace) and UNIFEM organized a business training seminar for representatives of each of the 17 recipient groups. This was to assist them in becoming sustainable businesses pursuant to a government mandate that all associations become income-generating cooperatives. On April 6 at 7:00 pm Pacific time (10 pm DST), Pacifica Radio KPFA (an NPR affiliate station) in Berkeley, CA broadcasted an 11-minute segment about the Rwanda Knits project on their show, Full Circle. The show, inspired by the UMass Magazine article, was hosted by Donna Bellorado who interviews me about the project and includes an interview with Rwanda Knits' project manager, Geofrey Katushabe and two of the Rwanda Knits' teachers, Esperance Nyirarusimbe and Furaha Mukamusoni, who joined us from Kigali, Rwanda. This segment was especially relevant airing in April, the 13th anniversary of the 1994 Genocide. You can listen to it by clicking on their archived shows.